Raise the Minimum Wage to $15! Fight for the Living Wage! 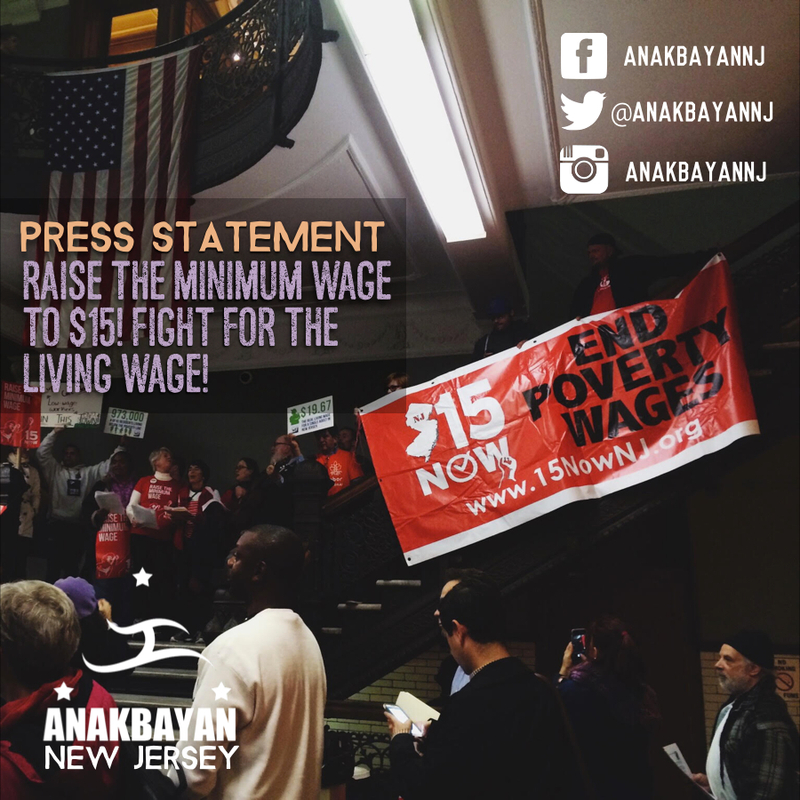 Anakbayan New Jersey sends its deepest support for 15 Now NJ’s nationally coordinated Day of Action calling for the $15 minimum wage and the right to unionize. 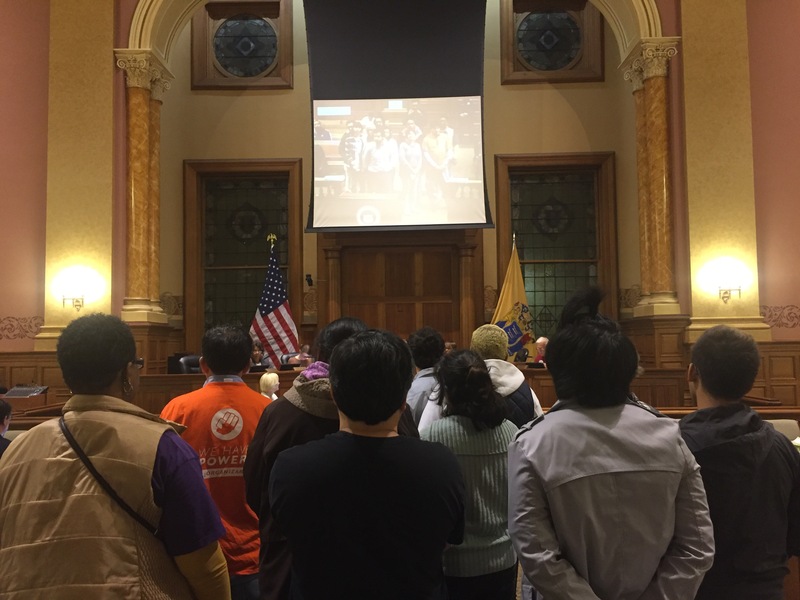 On November 10, 2015 low-wage workers, unions, community groups, and allies gathered in Jersey City’s City Hall for a rally and the third resolution calling on the State Legislature to raise the minimum wage. After deliberation the resolution Jersey City Council successfully voted unanimously 8-0 in favor of the resolution to raise the Minimum Wage in NJ. The Fight for 15 has been waging for three years across the country since its launch in 2012. Multiple cities are proposing laws, and Seattle was even victorious. New York City’s Fast Food Wage Board also recommended a $15 minimum wage for fast food workers. As one of the most diverse cities in the U.S. with one of the largest immigration populations in the state, the conditions are ripe for Jersey City workers to demand a $15 minimum wage. In New Jersey, the cost of living is higher than the wages earned. According to the Working Families, the average adult needs to make $19.67 per hour to sustain themselves, without consideration of their families. Further, an adult earning minimum wage must work 100 hours for a one bedroom apartment according to the National Low Income Housing Coalition. With the shift to one-parent households and increased gentrification, a $15 minimum wage is necessary now more than ever. As youth and students, we would all directly benefit from a $15 minimum wage and the right to unionize. With the increasing education crisis, tuition fees are becoming more expensive and students are getting further in debt. By taking up these struggle for the rights and welfare of low-wage workers, the youth advocate for their families and empower themselves. $15 now, living wage next! 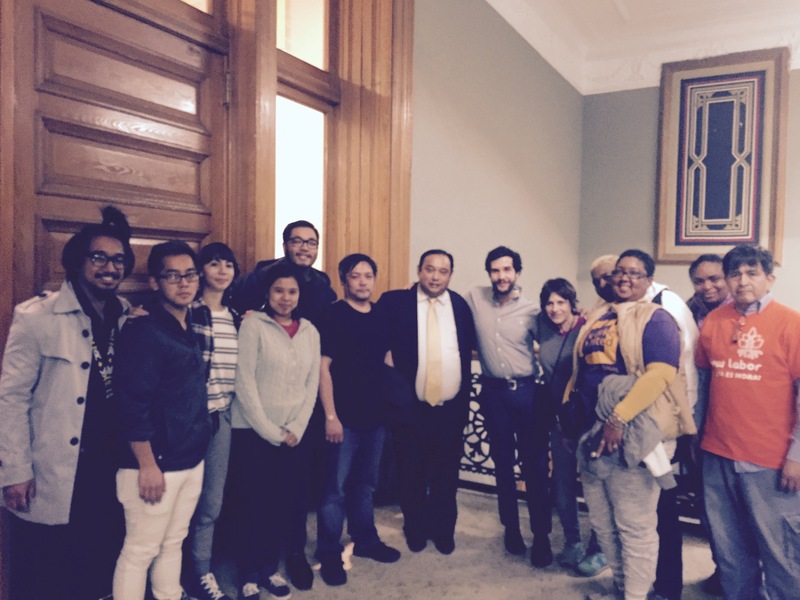 Anakbayan New Jersey, FIWOP: Filipino Immigrant Workers Alliance and 15 Now NJ posing with Council President Rolando Lavarro after City Council votes 8-0 on the resolution for $15 min wage in NJ.